Isla has taken her talking to a whole new level lately and it is cracking me up. Just the other day, we pulled into the Starbucks drive thru and she says from the back seat "I want hot chokate and cream". What?! You know how to ask for that?! It shocked and entertained this mama...and she got what she wanted. Some of the other things the has been saying lately are "too me" (excuse me), "Mama, yoooou doing?" (what are you doing?) and one that really makes me laugh "look at me". Some of Isla's current favorites include bracelets (or really all jewelry), boots (yep, she love her some footwear), the play kitchen, coloring and trains. More often than not, Isla will try to put on all of her bracelets at one time. What really gets me is how then she will protect the arm covered bracelet and not use it so all the bracelets stay on. Isla wants to play with Connor more and more and as long as it doesn't involve Connor's legos (which Isla loves), then he is generally ok with it. Well, and if he can control the situation, but you know. Isla is also a big fan of being outside. She loves rocks. Like a serious love of rocks. She likes leaves as well, but I caught her calling them "flowers". A month ago, I almost switched Isla out of her crib. It was her second bout of climbing out of her crib and she didn't seem to be stopping. Then, the two of us went to LA for my dad's surgery and when we came home, she hasn't climbed out of her crib since. Though I still put Isla down for a nap every day, she seems to be actually going to sleep only about half the time. The other half, she lays in her crib for hours, just talking away. She really could use a nap, but I obviously can't force it. On the days she doesn't nap, she usually really struggles from dinner time on and is in bed asleep early. She had been doing great sleeping through the night, but the last couple weeks, she has been waking up multiple times a night more often than not. And when she wakes, she wants her mama, not daddy. Once I hold her, she usually goes back to sleep quickly. And she still enjoys sleeping in, which I enjoy. If we have nothing going on, she generally will sleep in until at least 9am. Isla is a very tough little girl. That is probably the thing I hear the most about her. People are always shocked that she doesn't cry, even with a big fall. But, she has to deal with her brother all day, so she is used to it! Because we knew she could handle herself around older kids, we moved her up to an older class at church. The toddler nursery is just chaos (I know, I work in it) and the next class up is just a lot more fun and calm. She is doing great in it. For a bit there, I thought Isla would never have an interest in potty training. She downright freaked if I got her anywhere near a toilet. Then one day she acted like the potty was the coolest thing ever and even peed on it. Then I decided to try undies and she went through three pairs in less than an hour. So, I am throwing potty training on the back burner for a few months. I am a believer in waiting until they are ready and it will go easier. And wait I will do. Isla, my little spitfire. You love to lay your head on my shoulder and sometimes will say from your bed "mama, need you" and it melts my heart. I thank God every day that he blessed me with a little "dia" (quesidilla) loving girl that loves her mama so much. You make me happier more than you may ever know...until you have kids of your own. You can watch Isla grow up to quickly see all of Isla's past updates here. I'm a sap, so I peruse both her and Connor's past updates all the time. How come I didn't realize until now that our daughters are only 3 days apart? Your Oct 2011 baby wins the title of world's most beautiful hair, however! Though I don't remember how I found your blog, that is what initially drew me in, our girls being so close in age. It has been fun to always read Taylor's updates and see how vastly different two girls of the same age can be. Cute outfit! 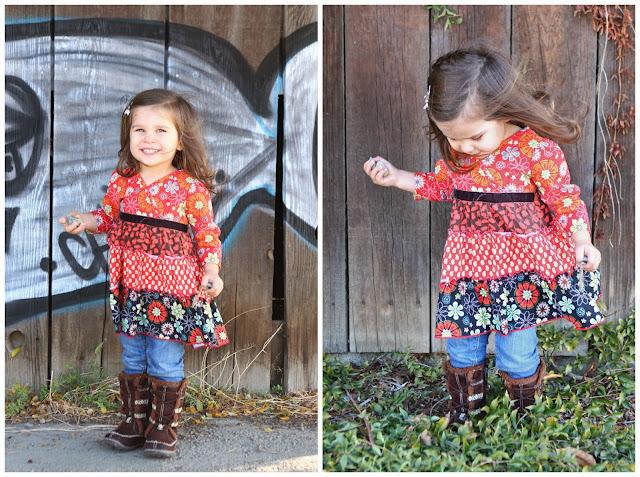 Little girls have the best clothes! She is such a beautiful girl! And i like the fence background! Where is that? I really enjoyed going back and looking at Isla's past updates also! She has really matured so much!! I love hearing her talk! Gosh, I seriously adore her hair! Isla is such a gorgeous little girl.